The long-awaited 3G/4G follow-up to Novatel's uber-popular MiFi has arrived at last: the MiFi 4150L is here! When the MiFi 2200 hit the market for both Sprint and Verizon back in 2009, it was an instant hit... and remained that way for almost two years. We anticipate that the new 3G/4G version will make a splash as well, as it offers all the same features that made its predecessor so popular as well as some new capabilities that make it stand out. Obviously, the primary difference between the original MiFi and the new 4150L is the 4G-capability. 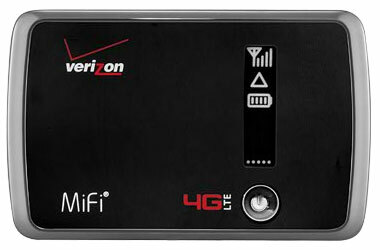 The MiFi 4150L is 3G/4G capable, meaning it can connect to Verizon's super-fast 4G LTE network where available and fail back to the nationwide 3G network elsewhere (check Verizon's coverage map to see which network is available in your area). This device also features a slightly improved WiFi range (30+ feet; the MiFi 2200 only provided about 20' of WiFi coverage). The Novatel MiFi 4150L is in stock NOW at 3Gstore for just $99.99 after rebate with a new 2-year contract!